The U.S. average retail price of diesel fell 1.6 cents to $2.776 a gallon, and oil pushed over $50 a barrel amid reports of possible cuts in supply. Diesel and gasoline prices fell as fast-moving Hurricane Nate barreled through portions of Mississippi and Alabama as a Category 1 storm on Oct. 8, disrupting power for an estimated 100,000 people before weakening as it moved into the Mid-Atlantic region. At the same time, about 59% of oil production in the Gulf of Mexico remained shut in, which equates to 1.02 million barrels of oil per day. But production was ramping up. 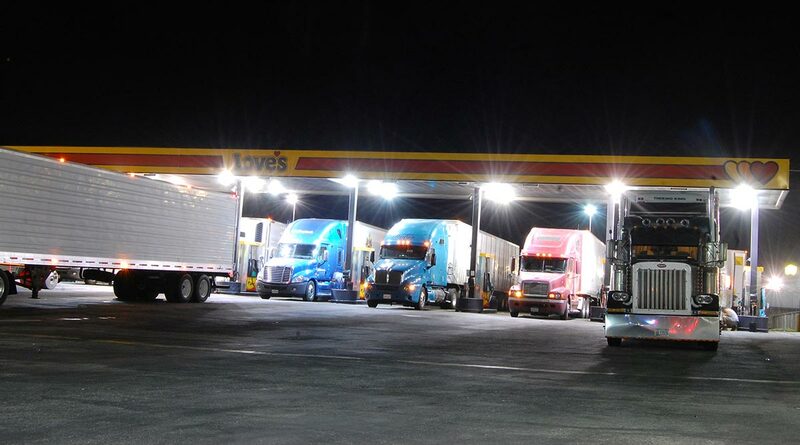 Prices for trucking’s main fuel fell in all regions. The U.S. average price for regular gasoline fell 6.1 cents to $2.504 a gallon and cost 23.2 cents more than it was a year ago, DOE’s Energy Information Administration said. Gas prices fell in all regions. “Once all standard checks have been completed, production from undamaged facilities will be brought back on line immediately,” according to the bureau. Diesel now costs 33.1 cents more than it did a year ago when it was $2.445 a gallon, the Department of Energy said Oct. 10. The U.S. average price for regular gasoline fell 6.1 cents to $2.504 a gallon, and cost 23.2 cents more than a year ago, DOE’s Energy Information Administration said. Gas prices fell in all regions, too. Meanwhile, during a recent evaluation of thousands of drivers, one achieved near-perfect fuel efficiency while driving 2,500 miles for Dayton, Ohio-based truckload carrier Jet Express Inc.
Driver Tammy Newcomer, during National Truck Driver Appreciation Week, achieved 99.92% of potential miles per gallon while her truck used about 280 gallons of diesel, according to analytics company Vnomics, whose onboard fuel optimization system, True Fuel, is installed in Newcomer’s truck. Newcomer placed first out of 20,000 drivers Vnomics evaluated in September, winning Vnomics’s first Fuel Champ Award and a check for $350, which represents the amount Newcomer’s skillful driving saves Jet Express each month in fuel costs, according to Vnomics. “I don’t speed, for one thing. Believe it or not, I don’t use the cruise control. If the speed limit is 65 mph, I’m doing 63. It’s 70, I’m doing 68. Also, I try to make sure that I ease up as I look ahead to see what’s coming so I’m not being hard on the brakes,” Newcomer told Transport Topics. “I don’t let my truck idle. I think that is a big difference with the fuel savings, whether I’m in a truck stop, at a rest area or at shipping and receiving. I never let my truck idle, just because I feel that is a waste,” she said. Also, Vnomics informed Newcomer she had made a dent in the carbon footprint over the past year with her fuel savings and the way she drives, emitting 13.2 tons less carbon dioxide than a typical driver. “That means a lot to me, because someday I would like to live off the grid. I get e-mails from [Tiny House Nation] and watch [the show] on HGTV. I am real impressed with saving energy, however we can,” she said. Newcomer shifts her manual 10-speed transmission by listening to the truck’s revolutions per minute. She can hear when they get to about 1,500 or 1,600, then she will shift without using the clutch. “It usually slides right into gear,” she said. Turning to oil, its closing price Oct. 10 was the highest in more than a week. West Texas Intermediate crude futures on the New York Mercantile Exchange closed at $50.92 on Oct. 10, compared with $50.42 on Oct. 3. Saudi Arabia-run Saudi Aramco plans to pump about 9.77 million barrels a day next month, in what would be its smallest output since January 2015. That’s about 1 million barrels a day less than the 10.72 million it pumped in November 2016, Bloomberg News reported. Also, U.S. commercial crude oil inventories decreased by 2.8 million barrels from the previous week but are near the upper limit of the average range for this time of year. Inventories of distillate fuel — primarily ultra-low sulfur diesel used in transportation and to a lesser degree as heating oil — fell by 1.5 million barrels and are in the lower half of the average range for this time of year, EIA reported.